*CNS stands for central nervous system. 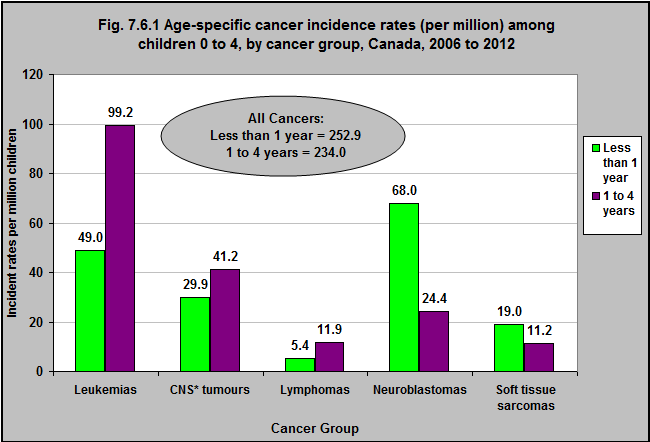 Source: CICH graphic created using data adapted from Lawrence Ellison L and Janz T. Childhood cancer incidence and mortality in Canada. Health at a Glance. Statistics Canada Catalogue no. 82-624-X. September 22, 2015. http://www.statcan.gc.ca/pub/82-624-x/2015001/article/14213-eng.htm#a8 – accessed June 22, 2017. Between 2006 and 2012, neuroblastomas were the most common kinds of cancer in infants less than 1 year old. During that same time period, leukemias were the most common kinds of cancer among children aged 1 to 4 years. Leukemias, central nervous system tumours, lymphomas, neuroblastomas and soft tissue sarcomas accounted for 68% of all cancers among infants under a year and 80% of all cancers among 1 to 4 year-olds between 2006 and 2012.